A brand-new interview series is now available from our very own podcast, The Odyssey ScoopCast! 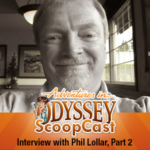 The ScoopCast brings in Phil Lollar, co-creator of Adventures in Odyssey, for a behind-the-scenes interview. Phil discusses his involvement with the Jungle Jam radio drama and Little Dogs on the Prairie video series. Plus, he details his involvement in the creation of four flightless birds for the animated video series 3-2-1 Penguins. But a podcast wouldn’t be complete without Phil’s insights into his current audio drama project: Iliad House. This is the first installment of a one-of-a-kind interview with one of Adventures in Odyssey’s co-creators. 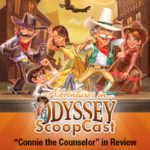 To learn more about The Odyssey ScoopCast and how you can subscribe and never miss an edition, click here.